Visit McMinnville has put together an excellent promotional tour of the wineries of downtown McMinnville and the nearby McMinnville foothills. Dubbed the McMinnville Wine Walk, this self-guided tour introduces wine tasters to the twenty tasting rooms scattered throughout McMinnville. 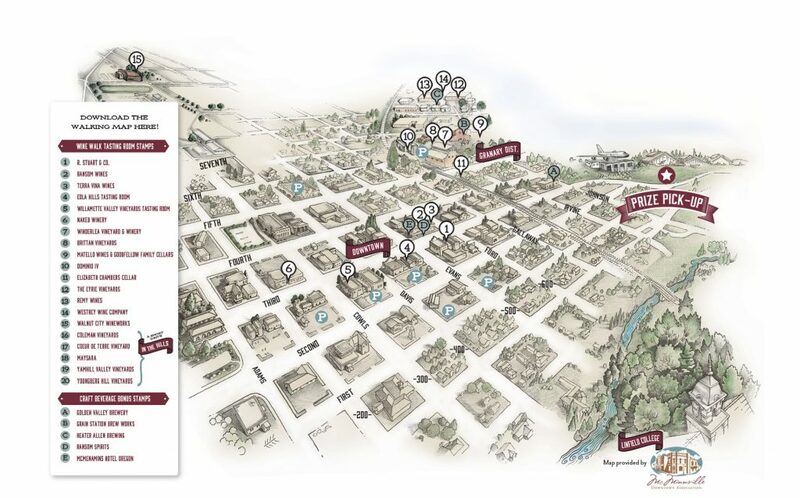 Wine tasters can pick up a Wine Walk passport at any of the twenty tasting rooms. Each tasting room will stamp your passport when you visit, with prizes for wine tasters who visit over 10 tasting rooms (warning: don’t try it all in one day!). Members of the McMinnville Winegrowers Association participating in this promotion include Brittan Vineyards, Maysara, Yamhill Valley Vineyards, Coeur de Terre, Coleman and Youngberg Hill. Brittan Vineyards is part of the walking route in downtown McMinnville, and our other five members are a short drive into the foothills. For more information, visit the McMinnville Wine Walk website. We also encourage you to use the Visit McMinnville Website as a resource for planning your next trip to our region!